As an developer, who don't know the importance of the good compiler for executing the developed applications? Many of my beginner developer friends, nowadays, are confused how to use Turbo C++ compiler for C/C++ programming language in Windows 7. 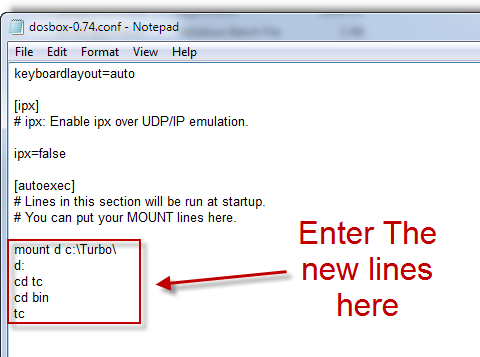 So, here is a tutorial how to install Turbo C++ in your PC running Windows 7. Some of my friends are using several tricks to use it. Some have downgraded to Windows XP. But this is not possible for all to move back to Windows XP for a single application, and becomes more difficult if you are addicted to Windows 7. First of all, a fact should be known that Windows 7 don't directly support any DOS based applications to run into it. So, first of all, you need to install a third party application called DosBox 0.74. This application basically provides the essential environment for Turbo C++ or any DOS related application to execute in it. Now, install DosBox as usual. Don't download Turbo C++ setup from any other location, as it won't work. Only download it from the link provided above. 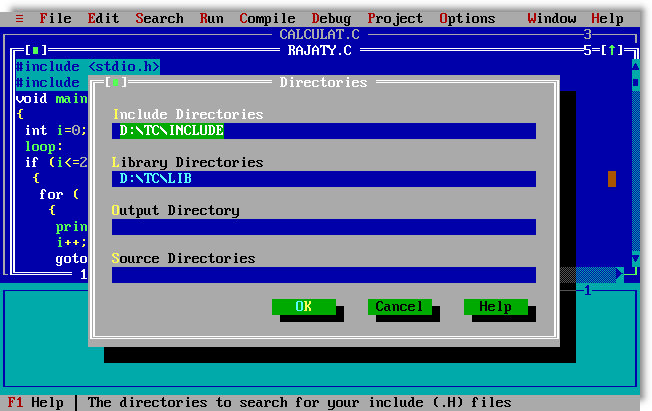 Now go to the directory where the program DosBox 0.74 is installed. 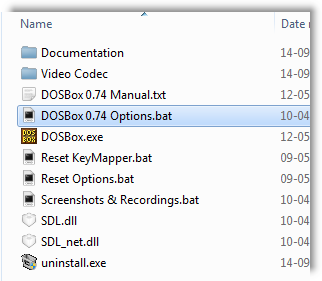 Open the file named DOSBox 0.74 Options.bat. It will look like below image. Now navigate till the end of the file and insert the lines shown in the image below. If you can't see the lines in the image, here are the same lines. 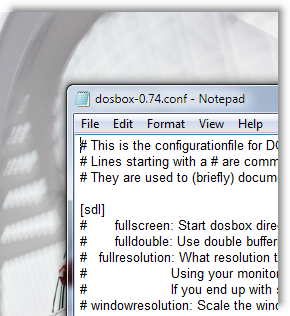 After editing is done, save the file and then open the DosBox it will open like this. If you want to have a full screen feel, press Alt+Enter to see the window in full screen. 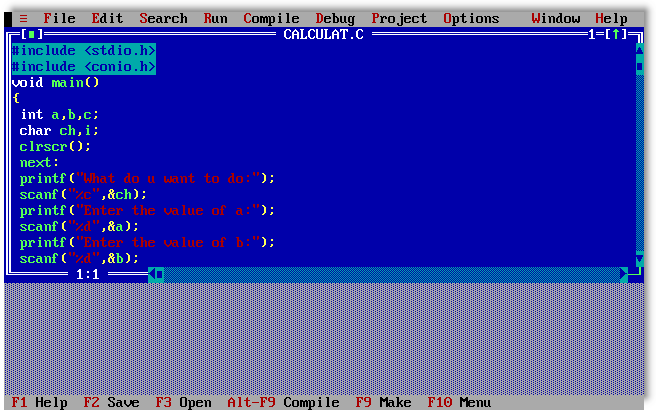 Now, in Turbo C editor, goto Options > Directories..
Now put the following values in the fields mentioned below. The following image will give you a clear idea. 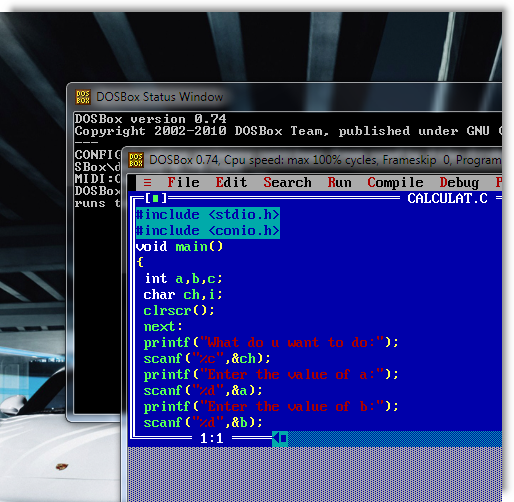 Enjoy C Programming on Windows 7.